While Kristen and I were in Tampa, FL for the Honda Civic Tour, we got the opportunity to visit the Hard Rock Hotel & Casino. What an experience! First of all, it is HUGE. There are two parts to the Hard Rock: the hotel, and the casino (hence the name). Because there are two parts to the Hard Rock, there are two main ways you can access it. You can either enter from the front of the hotel, where the valet service is quick, efficient, and reasonably priced, or you can park the car yourself in the parking garage and enter the casino from any of the elevators in the garage. We parked the car in the parking garage and entered the casino. Our original goal had been to start in the hotel, and maybe grab a bite to eat from one of the many restaurants in the hotel, but I didn’t know that parking in the garage led directly to the casino. We wandered around for a bit, taking pictures and goofing off, but we ended up getting lost. After all, the casino was great, but we were hungry! Remember that my directional skills are rather sub-par. I use a GPS to get me wherever I need to drive. 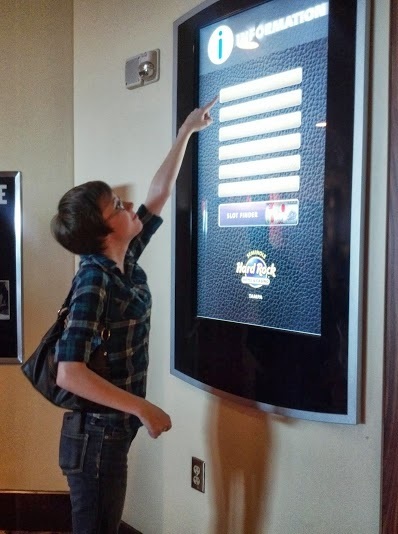 The great thing about the casino was that they have giant electronic touch-screen boards scattered about, hanging on walls, standing by entrances. Each board has multiple categories to choose from to inform you about the hotel and casino. It had lists of the restaurants and stores, amenities, spa information, and among other things, a map. They really thought of everything when they programmed the boards! I’m just a tiny person in a big, big world! The electronic boards were BIG! After we wandered around the casino for a bit, we went to the hotel. The hotel is amazing! The staff is so courteous, the decor is fabulous, and the rooms are comfortable! I’m a young adult, so I’m still not used to people addressing me formally as “ma’am” or “miss”, but everything was “Yes, ma’am”, “May I help you, miss?” and “You are very welcome.” I really had this idea in my head that the Hard Rock was a casino, so I wasn’t exactly prepared for or expecting the service quality of a fine resort! Every staff member I spoke with greeted me with a smile. Every single one! They even smiled and nodded acknowledgment when I walked by. I was very impressed! What I was most impressed with was the valet service. We started out parked in the parking garage, but didn’t want to walk all the way from the casino to the hotel, so we decided to drive over and valet the car. When we pulled up, there was a long line of cars waiting to be valeted, and at first I got a little judgmental of the service. I thought that the valets must not be very efficient for the line of cars to be so long, but when I pulled up to have my car parked I noticed that every single member of the valet staff was working very hard and incredibly efficiently! They were running back and forth, but still taking the time to provide excellent service. My heart towards the quality of service changed when I saw a young gentleman assisting an elderly couple out of their car and taking the time to smile at them and give them a warm. The last thing anyone wants is to start out a trip with the very first staff member they see – the valet – so focused on the job that the client does not feel acknowledged. In such a fast-paced job, it can be easy to do things so quickly that the quality of service is lost, but these impressive valets were managing to get the cars parked quickly, while still ensuring a personable, pleasant experience. We entered the hotel and I let the front desk know that I would be taking pictures and poking around here and there, and they were very obliging! They said I could take pictures of anything I wanted except for individual gaming tables or slot machines. Kristen and I wandered around, and honestly their front lobby feels like a mall! There are stores to shop in, restaurants to eat at, and on either side there are gaming tables and slot machines and other various casino games. We saw a lot of the casino, and some of the hotel, but my favorite part was the music memorabilia that was everywhere. We are both major music buffs. Personally, I’ll listen to any kind of music! I have so much appreciation for unique sound and artistic expression through music, especially when an artist’s unique sound paves the way for an entire music genre. Needless to say, I was geeking out a lot at the Hard Rock! 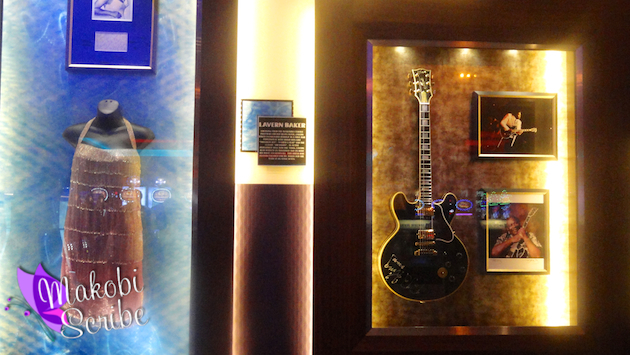 Everywhere you turn you come face-to-face with memorabilia from the music industry’s greatest icons. I am totally not one of those fangirls who swoons because some such-and-such musician sneezed in a hankie hanging on the wall, but seeing the things hanging on the walls really brought everything to life for me. They had things like Frank Sinatra’s suit hanging in glass on the wall and I could easily imagine him on a stage just a few feet in front of me singing “Fly Me To The Moon” to a crowd of thousands of screaming women, music connoisseurs, and record producers. 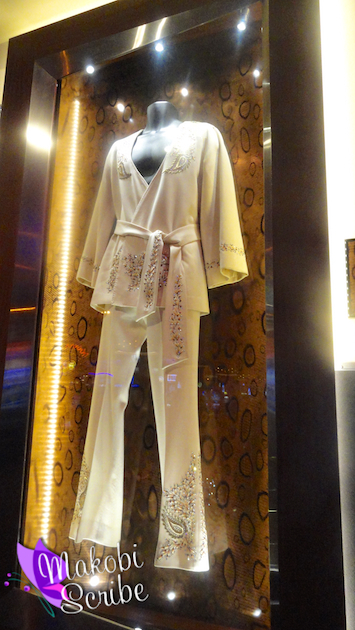 It was surreal to see the outfits that music legends like Jimmy Hendrix and Frank Sinatra performed their biggest shows in. They have instruments hanging on the walls. They have tribute paintings. They even have a pair of John Lennon’s glasses! On top of the casino and memorabilia, among other restaurants is the beautifully elegant Council Oak. 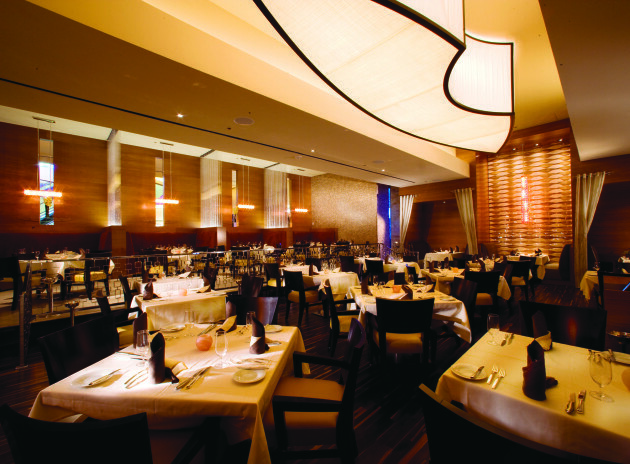 The Council Oak is an upscale restaurant that is most noted for their steak and seafood. The atmosphere is very ambient. It’s perfect for a nice romantic dinner, or something like a business meeting over wine and steak. It’s a nice, peaceful break from the fast paced movement in the casino, and the food is absolutely delicious! The casino is exhilarating, the dining is enchanting, but if you’re an introvert like I am, the busy din of everything – even from places like the spa – can get a bit exhausting. I’m not so introverted that I scorn human interaction, but I do need a good place to recharge. When I’m trying to find a good hotel, what seals the deal most for me is the room, because for me to recharge it needs to be more than just a bed, a television set and a bathroom. I’m all about finding a room with the perfect feel, and the rooms at the Hard Rock are very nearly perfect! The Hard Rock Hotel feature four types of rooms: the Queen Deluxe, the King Deluxe, the Spa King, and the Luxury King. All rooms come with a flat screen TV (complete with a rocking sound system!) and free high-speed Internet access. The Queen deluxe is the most modest of the four rooms. It has two Queen-sized beds, and a bathroom, with decent floor space – that is to say, enough space for an over-packer like me to put my bags down and still have room to walk around! The King Deluxe is about the same size, and has one king-sized bed instead of two queen-sized. They’re pretty basic rooms. However, the Spa King is a little more than just basic! As well as a king-sized bed and the standard amenities, it has floor-to-ceiling windows to let in plenty of beautiful natural light. The bathroom is BIG, and features a shower separate from the oversize jetted tub. The Luxury King is much like the King Deluxe, however it is also furnished with a small table and chairs, a coffee table, and a couch. As luxurious as the rooms were, my favorite part was a feature that they offer where you can put a request in for certain choice electric guitars, turn on your TV, and play along with classic rock songs! To put it simply – it was awesome! 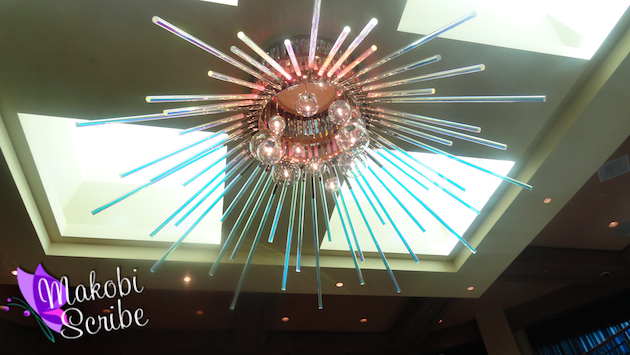 I really wish I could have spent more time at the Hard Rock Hotel and Casino! It’s a great place to vacation, even if you never leave the hotel! The casino is a great way to have a high-energy time playing games and meeting people, the pool is a beautiful way to spend time in the good ole Florida sunshine, the spa is relaxing, and the rooms are so comfortable. The service is exceptional, the staff are friendly, and every part of my experience was absolutely wonderful! I can’t wait to go back! The Seminole Hard Rock Hotel & Casino Tampa is a major entertainment destination that blends the excitement of the Hard Rock brand with a first-class boutique hotel and casino. It is the sixth-largest casino in the world and the fourth-largest casino in the United States, based on gaming positions. In addition to the casino, the complex consists of a 12-story hotel tower, pool, eight dining options, six bars and three enclosed parking facilities. I would visit the Rock Spa first. I’d go to the Noodle bar first cuz I love noodles! I gotta be honest, we’d hit the slots first. The Hard Rock Cafe and then to the slots. I would go to the casino first. I’d visit the restaurant first because I’d likely be hungry after a long drive. the buffet upstairs, it’s awesome. I would head to the restaurant and check out the memorabilia with my family! I want to get to the registration desk so we can check into our room, get settled, then head downstairs to the Council Oak for dinner before hitting the tables. i would have to visit the casino first! I’d stop at the Hard Rock Cafe first, if I could prevent my husband from heading straight to the poker table! The restaurant is usually first for us! I’d stop by the Hard Rock Cafe first. I have dined in the Council Oak Room twice. The service is great and the steaks are delicious. The hotels rooms are beautiful. They have the most comfortable beds. It is a very nice casino. I would have lunch at the Hard Rock Cafe first followed by playing the slot machines after. I would stop by the hard rock cafe first! I’d go to Council Oak first! I would start of by going to the Rise Kitchen & Bakery. Over 40 varieties of sweet treats sounds irresistible to me. I’d have to have a sandwich & soup fist to start off with. Oh, and I absolutely love Dr. Brown’s soda so I’d have to wash it all down w/a Dr. Brown’s Black Cherry soda! We’d definitely go to Council Oak– Sounds delicious! I would go to the restaurants. I would visit the spa and get a massage! After, I would have dinner in the Hard Rock restaurant. I would so go to the restraunt, pool, spa and the big comfy bed first!! I would visit the pool first! I would go to the casino first. Thanks for the awesome giveaway! The Hard Rock Cafe! We love that place! I’d like to check out the Whammy Bar, in part because of the clever name! I would go to the restaurant and have some good food. The restaurant first! I like the food! I would go to the pool, eat, then on to the casinos! Thank you for your hard work in hosting this! Thanks for the chance to win! The restaurants then the pool! I always stop at the Hard Rock Shop first to see what new pins they have! I go to the cafe one first (that’s usually closer to where we come in when we park) and then the casino one. The casino or pool bar!! That place looks awesome!!! Thanks! I would visit the food court first. I’d go to the Casino first! I would first see the room, if we stay, but then the spa, thanks! I would visit the restaurant first. jehe Spa first thank you!! I love this Hard Rock Casino! I go whenever I can as it is about an hour drive for me. I would first hit the newest slot machine room. It has it’s own atmosphere and great slots. Definitely the Casino would be my first stop. There isn’t a better feeling than when you first walk in to try your luck and good fortune comes your way with a win! I would go to the poker room. I go several times a year. My first stop is always the casino. First I’d visit Fresh Harvest Restaurant. I would go to the slot machines and casino. I would probably visit the 3 card poker table first…..then food. To eat at the Hard Rock Cafe! I would hit the bar and the slots, same time!! LOL. I’d head straight for the slot machines in the casino! I would go to the Hard Rock Cafe first. I want to check out the casino! I would probably check out the stores. I’d check out the gift shop. Gotta get my logo items! the slot floor and the cool center bar! I would visit the Casino and have some fun! I’d visit the buffet first!! I always have to check into my room first . . . thenthe pool/spa area. I’d go to the beautiful restaurant! I would go to the Council Oak Steaks & Seafood restaurant. I’d go try out the gift shop and the blue room!